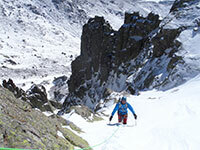 If your hobby is becoming something more than just a hobby and you want to go a little further, dare to advance by doing any of our various mountaineering training courses in Madrid, Pyreenes or Sierra Nevada. 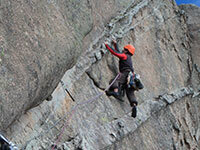 Patagonia offers courses adapted to your level, from basic to specific techniques, to enjoy and learn to climb safely. "Introduction to Rock Climb", "Outdoor Climbing Courses", "Advanced (Traditional and multipitch Rock Climbing)", "Abseil Courses", "Aid Climbing", "Tailor made Courses". Acquire practising, the necessary techniques to enjoy the mountains safely with our experienced and qualified guides, "Introduction to Mountaineering", "Advanced Mountaineering", "Mountain GPS". 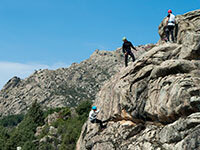 Madrid, Pyreenes and Sierra Nevada are the perfect spots! Learn and practice the necessary skills to move in the winter season safely and in a autonomous way. 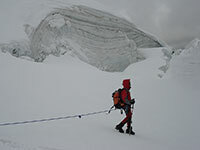 "Introduction to Winter Mountaineering", "Advanced winter Mountaineering", "Glacier Progression and Crevasse rescue", "A.R.V.A", "GPS in winter mountain", are some of the training courses, ask for more! Can't find exactly what you are looking for? We are happy to create it for you. 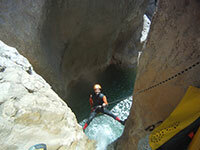 You can hire one of our instructors or guides, including any equipment. If you’re a group, all of our courses are available on a date that suits you or if you would prefer we can tailor a course to your requirements. Simply give us a call to discuss your requirements.